The team at BCS does great work and turn around time is amazing. Thanks Carrie, Henry, and rest of the team! 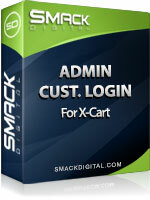 Admin Customer Login for X-Cart allows you to login and use the store as one of your customers, and then click a button to instantly log back into your X-Cart admin section. This allows you to modify your X-Cart eCommerce store as an admin and then easily login as a customer to test, place phone orders, and/or provide functions of customer support, while remaining just one click from your X-Cart admin section - without having to re-login. Modify your store as an admin and test as a customer without having to relogin. Place phone orders for your customer. Provide customer support by viewing the users account. Very easy to install - just 3 files to upload and 1 line of code to change. Uses 1 browser and doesn't require you to log back into your admin account. Passwords are passed encrypted for security. NOTE: A browser that supports frames (i.e. Internet Explorer, Firefox, Netscape) is required to use the link to log back into your admin section.